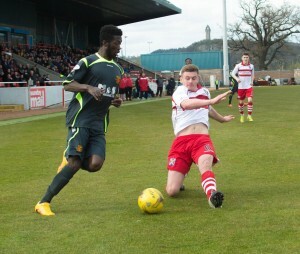 Annan’s chances of making the play offs now rely on a victory over Queens Park by at least 2 goals in the next Saturday’s last game of the season following the teams defeat at the hands of Stirling Albion at Forthbank . Following fast on their surprising defeat at the Hands of East Stirlingshire the previous week it was disappointing performance from Annan who were up against it from the 7th minute after The Binos took the lead and from there on in they were left chasing the game and it was only on the last ten minutes that Annan started to impose any authority on the match. The home team started brightly and in their first attack Scott Davidson headed over from a well directed Ross Forsyth free kick. Annan forced a corner at the other end with Swinglehurst heading past the post. Stirling opened the scoring on the 7th minute when Steven Dickson slipped the ball into the path of Moses Olanrewaju who had the time to control the ball and finish with a low shot past Jordan Hart form 8 yards. Annan replied when they forced another corner kick with Weatherson heading past the post in the 15th minute. Swinglehurst was given a yellow card in the 26th minute for a tackle on Lewis McLear. As the game approached the half hour mark Flynnn’s header from McNiffs cross produced the first real save from Cammy Binnie. Minutes later Jordan Hart denied Lewis McLear when he pulled off a fine save to push the ball away for a corner kick with Davisdon heading McLear’s corner over the bar. Lewis McLear then tried his luck with a 20 yard effort which flashed past the post and at the other end Annan’s best move of the match ended with Todd and Flynn combining down the left with Flynn sending in an inviting cross for Weatherson who headed narrowly past the post. Jordan Hart averted a potentially dangerous situation at the start of the second half when he pulled off a save to deny Olanrewaju . Todd’s 56th minute effort tested Binnie with the keeper pulling out a confident save. Ross Smith was given a yellow in the 62nd minute after fouling Weatherson who’s resultant free kick 30 yards out was blocked. Josh Todd blasted over the bar from a promising position in the 70th minute as Annan pushed forward but it was the home team who doubled their lead in the 75th minute when substitute Ross Kavanagh made an immediate impact after the Annan defence were caught on the turn and the ball played wide to Kavanagh was despatched into the bottom corner of the net by Kavanagh. Annan were well and truly up against it and when Osadolor had a goal chalked off for hand ball in the 82nd minute all seemed lost but minutes later Annan pulled a goal back. Substitute Rabin Omar created the goal with a penetrating run down the left wing ending with a cross to the near post and Josh Todd was at hand to slot the ball into the corner of the net from close range. Todd once again came close when he headed over an Omar corner in the 88th minute as Annan went all out to square the game .At the other end Comrie tested Hart. It was however too late for Annan to take anything from the match and they now face a stern task to make the play offs against the team with the best defensive record in the league. Annan however can take heart from the fact that the Spiders have not beaten Annan this season and scoring goals has not been a problem as Annan are the leagues top scorers but their down-fall this season has been their inability to defend, the big question is can Annan pull it off in the final match of the season. STIRLING ALBION : Cammy Binnie, David Verlaque, Ross Forsyth, Aurelien Mazel, Ross Smith,Scott Davidson, Phil Johnston (Ross Kavanagh 75 min), Sean Dickson ( Craig Comrie 71 min), Sean Dickson, Steve Doris, Lewis McLear (Jordan Herron 83 min), Moses Olanrewaju ( Ross McGeachie 90min). SUBS NOT USED: Jordan Herron, Ross Kavanagh, Kevin McKinlay, Scott Stevenson, Chris Smith GK. ANNAN ATHLETIC: Jordan Hart, Steven Black (Steven Sloan 60 min), Steven Swinglehurst ( Rabin Omar 83 min), Martin McNiff, Peter Watson, Barry Cuddihy, Jack Breslin, Matty Flynn, Peter Weatherson, Josh Todd, Lewis Guy (Smart Osadolor 63 min).SUBS NOT USED: Blair Currie, Stuart McColm, Liam Park and Ben Jago.